All Posts in "My Journey"
I know there are people who go to other countries and complain about everything they find there. And I know people who go to other countries and complain about everything they left behind. I don’t belong to either camp but I have a little of both. I think it’s good to have both perspectives. I can’t really compare the UK and US in terms of good and bad, but rather more like they are different. A couple of recent comments from colleagues have made me aware of these differences. The first comment was: “I would never live in America. I could never live in a country where people won’t walk or cycle to work.” The second was: “I couldn’t live in Canada. It’s too backwards.” Canada is not the US, but in terms of “backwardness”, I don’t think Europeans discriminate between the two. There’s a misconception amongst my English colleagues that there are no sidewalks in America. That’s why it discourages people from walking. I’d like to point out that there were plenty of sidewalks in various places I lived. I will say that “in the sticks”, you might not find them easily, but the same can be said in the UK. I agree most people don’t walk or cycle to work in the US, because most of us don’t or can’t live near work. However, road access is much easier, so you can afford to live further out and still get to work. In bigger cities, such as NYC, you see crowds walking to work or taking public transport. I won’t deny some drive, but they would be insane to do so in such places unless they have to. The comments certainly point to differences in one’s priorities. I didn’t mind driving to work if I could live in a nice, quiet neighbourhood where I didn’t need to worry as much about my kid’s health and safety. Of course, my colleague is more concerned about the environment. I must say that people in the UK and Europe are much more aware, or much more concerned, about environmental issues that the US. I’ve known tree-huggers in the States, but the proportion of tree-huggers to gas-guzzler owners is quite minuscule. As for backwardness, I don’t know what to say. My husband did point out there are certain things that the British would consider backwards in the States. First of all, wireless. Practically all of the UK is wired for mobile phone and internet access. That being said, not all of the UK has high-speed access, yet. Of course, the US is huge compared to the UK, so there’s a lot more work that needs to be done in order to reach the same level of access. There are areas of the US that are quite remote and isolated, in terms of community and technology, and it’s questionable whether they will ever be taken forward. But, then again, if you were to move to another country, would you choose to move into the back woods? Probably not, since there wouldn’t be anything there in terms of work or play. We use the internet a lot and some areas of the States were difficult with high-speed access, but we got by. We didn’t care too much about cell phones and if we had a dropped line, we lived with it. Most cell phone use was not emergency and I find that people tend to use it so indiscriminately, it becomes annoying. We thought it was silly that everyone had a cell phone in the US, but it’s even worse in the UK. I suppose it’s backwards of me to think that we can live without a mobile, especially in an age where public phone access is being phased out. Speaking of phones, I find that many businesses in the UK don’t even have 0800 numbers. They usually have 0845 or 0844 numbers, which is cheaper, but not free. Most businesses in the States have toll-free 800 numbers to call when you have a question. It really discourages people to call if they have to pay for it. You are not allowed to use the work phone to make calls for anything outside of work. It is fraudulent, because local calls are not free. (That’s why everyone has a mobile.) Recently, we had to call an airline in an urgent matter at work, and the only number, which we received through the airport, was a premium number, charged at 65p per minute. That is the height of ridiculousness. The person making the comment about backwardness also mentioned New Zealand as being backwards, living in the 50s, with small shops, etc. I find it very funny, then, to hear that Canada was just as backwards. Canada, being very similar to the US, does not conjure up images of small shops for me. England was supposedly the nation of shop-keepers. Though it no longer is a nation of shopkeepers, it was the quaintness of small shops in England that I found charming. It’s perhaps not the most convenient way to shop, but to me, representative of a bygone era. I found the US to be much more convenient than the UK in terms of living. Towns were bigger. You could usually live, work and play in the same town (I say “usually” because it depends where you live in the States). Here, we live in one town, the kids go to school in another, extracurricular activities in a third, and I work in a fourth. It’s not London, but we’re not exactly in the villages either. It was easier to get around by car in the US; though I don’t mind the public transport in the UK. The only problem with public transport is relying on their schedule, which is affected by adverse weather. I have not been too inconvenienced by it, but to hear the natives complain…well, there’s still work to be done in that department. As I said, you can’t really say one is better than the other. The US and the UK are different. We’ve discussed staying vs. going back and can’t decide because it’s not about one being better. It’s about priorities and mentality. My sister sent my girls American Girl dolls as Christmas gifts. She said she sent them a while back, but due to the holidays, the strikes, etc., it only arrived at the ParcelForce warehouse just before Christmas. After Christmas, we received a notice stating that we owed money on VAT and a clearance fee. We were rather shocked. Why should we have to pay taxes on gifts that have already been taxed and paid on the other end? She spent over $200 for the dolls, $60 for mailing it, and now we have to pay almost another $50 to clear it and tax it. After some investigation, we found out that they can tax on gifts if it is worth more than 36 GBP. They will not charge Customs duty if it amounts to less than 7 GBP. However, all alcohol and tobacco will be charged excise duty. The clearance fee is a handling fee that Royal Mail and ParcelForce charge to cover their expenses: handling the postage, dealing with customs, paying import duties for you and collecting import duties from you. I don’t know what the US charges, if anything, for similar items. We’ve never had to go through this from the other end. Other things to note is that VAT is charged on internet sales if bought outside the EU and amounts to more than 18 GBP. Customs duty applies to goods valued over 120 GBP (except as above). Exceptions apply to alcohol and tobacco in that you may still have to pay excise duty. There are even more complicated rules for the Channel Islands. I still don’t understand how the Channel Islands fit into the scheme of things. I’m only working 4 days a week and I am enjoying my Fridays. That may change in a few months and at this time, I’m not sure how I’ll feel about that. I would definitely miss having an extra day off, especially to take care of business that can’t be done on the weekends. Part-time working has been much more attractive than I expected. The pay is OK. It doesn’t leave much for extras, and that may become an issue in the future. On the other hand, the decrease in stress is welcoming. I finally had time to read part of a newspaper today; although the paper is from several days ago. It appears that the government is trying to make businesses offer their full-time positions to job sharers and part-timers. There’s been criticism that although it is good for working parents to have that flexibility, the recession is not the time to introduce such measures. There were several points mentioned in the article that I find fault with. The first one, which irritates me many times when it is mentioned, is the pay differential. I’m not a true “feminist”, but I don’t think it’s right that men and women are paid differently. I can understand if the pay appropriately reflects their skills or responsibilities, but studies have shown that is not the case. Some might argue that women are not put into higher positions and are fighting for more women at the top. My stance on that is “May the best man/woman win” and I don’t like affirmative action just for equality – that is not true “equal opportunity”. The second point about the pay differential that irritates me when it is reported, is that the journalist goes for sensationalism and does not make a good comparison. For example, was it necessary to report on the difference between a part-time working woman with a full-time working man? Why not compare part-time woman (man) to full-time woman (man), or full-time woman to full-time man? That would really show the difference in income between working part-time vs. full-time, or between a woman and man working equal hours. And I will apologise for causing offence, but I do get annoyed when critics bring up the point of pay and promotion. I don’t know the inside track on every company, but there is a broad generalisation that women are not promoted as quickly as men. I agree that may be true. But when critics bring up the point that part-time working women are overlooked for promotions and they want laws to protect these women from discrimination, it does make my blood boil. If you’re looking to work part-time, isn’t it because you want fewer hours, thus less responsibility? Perhaps, it’s because you want more family time. Whatever the case, you’re looking for less stress. So, why would you want to be promoted to a higher position with more pay and more responsiblity? If you’re expecting higher payer with higher responsibilities, and you’re willing to put more time into it, then fine. I know women who work part-time in higher positions, but they don’t work strictly 9-5. Plus, they are on committees, which meet outside of their work hours. They may have other occasional duties that require them to be present for a whole week at a time. All fine and dandy. But, if you suddenly allow someone to dictate their own hours and still expect promotion and higher pay, you are really throwing a spanner in the works. Wow! It’s been a while since I posted. My hours were supposed to be 9-5, but there’s no 9-5 about it. Paperwork was rushed through so that I could start on the agreed date. It’s a good thing I’m only working 4 days a week. Unfortunately, last Friday was taken up with clearing out of the old house. Still some unfinished business, but after threatening legal action, I think the agents are starting to see our side. It also helped that a couple of them have already come out to see it and have exclaimed in disgust at the conditions we were forced to live in. Then it was our daughter’s last gymnastics meet last weekend, followed by another hectic work week. So, I am finally back to post about my time in Britain. I’ve had loads of things I wanted to say, but I’ve forgotten most of it. However, I do want to comment on my mode of travel these days. I’ve been taking the trains in to work. It actually works out less costly than if I were to drive (that is, if I ever get a chance to practice for my exam). The most inconvenient thing, of course, is to live by the train schedule. It can be tricky as well when the work days are so variable that you never know when you’ll finish, so you don’t know which train is best. In my first week, I just had to go with the flow. But, by the end, I managed to get a rough idea of the timetables from a couple different stations. The one closest to work is rather small, so there are fewer trains that stop there. So, some days, I have to walk an extra mile to get to the next station. I may have to get creative with the routes I take. It may mean that I also have to walk further at the house end. It’s such a novel thing for me to commute to work via public transport. I know that in big cities in the US, people do it all the time, but I never lived in those cities. It’s more common in the UK, even in the smaller towns. Given the state of the roads these days, I’m surprised not to see more people doing it. Of course, you start to notice the regulars on the train as well. It’s a bit of a surprise for me to find large groups of students travelling from one town to another to attend school – a state school, not a private one. It makes me wonder about the availability of schools. Which reminds me, the deadline for secondary school admission is next week – better get going on that. Don’t you just love it? I do. Fall is my favourite season. In hotter climes, I usually welcome autumn with relief. With my sun allergies, being in dry, hot weather can be a real nuisance. Not that I don’t enjoy nice weather, I just can’t enjoy like most people can. Of course, there are other reasons for loving fall. One is the change in colour. Some places are more dramatic than others, but I’m seeing the changes all around right now. I always get nostalgic for the times when we’d run and jump on a pile of leaves, or even looking for the multi-coloured leaves that have fallen. The spicy scent in the air and the crackling sound of dry leaves always take me back to those days. The sight, sounds, and scent is not the same over here, but there are other things to take its place. Halloween would be a big commercial event at this time in the US. Stores would have everything set for trick-or-treating or a spooky party or decorating your yard. I think I’ve seen one effigy here, and a small selection of costumes at a local shop. However, Bonfire Night is a totally different affair, and I can’t wait for that. I don’t know if we’ll go to Devil’s Dyke again for Halloween or try to find something spookier. One of the things I miss is the smell of pumpkin pie and spiced apple cider. Luckily, I waxed some bears in that cinnamon scent, so it helps bring back some of those memories. I also mixed it with a woodlands Christmas scent, giving it that wonderful Christmasy-fall-winter smell. I wish I had more time to just sit, relax and enjoy the season. Unfortunately, we’ll have to get busy packing up and trying to move. I’ve landed my choice job! It’s a good feeling to know that I have a job. Or, will have, very soon. After my second interview, I feel somewhat drained. Not that it was particularly gruelling, but the anxiety associated with interviews and the tremendous relief afterwards can leave you feeling like you’ve been hit by a truck. Then, I get excited knowing that we can stay in England, we can move house, etc. Then, I get anxious again because we have to move house, etc. Anyhow, my two interviews have renewed my confidence. It’s not a good feeling when you’ve sent out two dozen CVs and not get word for a long time. But, being offered a job on the spot is a big booster. I went ahead and did the second interview just to see how I would do (besides the fact that it was a little late to cancel on them). Though I wasn’t formally offered a job, I was asked if I would accept if it was offered and when I could start. They implied I was overqualified, and seeing that the only other interviewer at the time spent only 5 minutes with them, it was enough to convince me they were trying to see which way the wind was blowing. I had to admit that I couldn’t accept, but I wanted to know how I did. The main interviewer told me he could not see how I could not be successful in whatever I decided to pursue. Of course, as soon as I received my first offer, I got called for two other interviews. One was very tempting. I have to make a lateral career change and I have chosen two areas of expertise. The job I chose is in the field of my first choice. But, the job is a temporary one, and I will be starting out part-time, moving to full-time in a few months’ time. However, it’s a step towards my goal, and it gets me a foot in the door. My second job would be doing what I had done years ago, so a definite step down. The third interview, which I turned down, is similar to the second. All three are temporary. But, the fourth one would have been permanent and would lead me down a path towards my second choice of a career change. It’s tempting to go for it and see how I do, but I think it’s probably best to concentrate on finding another house and a new school, etc. There’s still that slight twinge of regret, but I know that the position would be a lot more competitive. It’s not that I regret my decision. But, the cost of living is a lot higher at my chosen job than if I chose any one of the other positions. On the other hand, there would be fewer transitions. For example, our daughter will still be able to go to the same gym and have the same piano teacher. They’ll stay in their school until mid-term at least. But, we’re moving because our lease will be up soon and we’ve had enough of all the problems in this house. I’m not sure how much longer before the rest of the floor in the kitchen will cave in. We have enough trouble walking around the areas that have already broken through. There’s also a hole in the bathroom. All the work that the landlord was supposed to take care of since we moved in has not been touched. In addition, they (agent and landlord) have not resolved this issue with the electric meter. As it turns out, we were right when we complained that we must’ve been paying for more than our fair share of electricity. So, until October, when I start my job, we will need to take a good look at our housing and schooling options. I was also very excited about my pay. I had been informed by several institutions that because I am new to this country, I would start at the lowest pay level. However, this place argued that with my experience, I should be offered something closer to the top (not the very top due to my inexperience in this country, but close). It means we will be able to maintain our current standard of living, which is by no means extravagant in any sense. But, to find a house in our price range will be very difficult down in that area. We will have to live a little ways out. My excitement has been tempered by the fact that next year, when I have actually worked a full year, my salary would be at a level such that I might have to pay double taxes – UK and US! I’ll have to look into this. To have to pay taxes to two different countries means that the take-home would be even less. And what makes it even more unfair is that the US uses an exchange rate of 2.1 (based on the currency exchange from several years ago), and not the current rate, which is closer to 1.6. The job interview – yikes! I have two job interviews this week and I’m a little anxious about them. It’s been over 6 years since I’ve been on a job interview, so I’m a little out of practice. Having been on interviews on both sides of the Atlantic, my husband has concluded that the interview process is much more serious and gruelling in the UK. He recalls being shortlisted for a job and was put up at a 5-star hotel for two days during the interview. The weekend comprised a series of panel interviews and tests. Not a story to reassure anyone. I do know that at the end of the second interview, I would receive an answer at the end of the day or the next day. Seeing that it’s a Friday, I may have an answer by the end of the day. However, my job preference is for the one on Thursday and at this point, I don’t know when they would inform candidates of their success/failure. All I know is that I will meet a panel of three interviewers. My other dilemma is that I still have not heard from the many other positions I applied for, and since some of them have not closed on their applications, I may not hear from them for a while. Yet, some of them are for positions I prefer over the one on Friday. Therefore, if I do not get the Thursday position, how do I approach the Friday one? I wouldn’t want to lose out on the chance of a job, but I also don’t want to rush on an acceptance if there’s a chance at my getting a better one. The only certainty right now is that we will have to move. And the girls start back to school in a few days. We went to London yesterday. It is only 40 miles north of here. But because of congestion charges and traffic jams, we knew we couldn’t just drive into the heart of London. Also, we needed to stop at my in-laws because they needed groceries. We left later than we had wanted due to various things, but it was about 8:50AM. I had an appointment regarding work at 11:45. My in-laws live in a southern suburb of London, so we were going to drop things off, walk to the train station, and take a train and subway to where we needed to go. That meant we had to leave their place around 10. Leaving at 8:50 meant we were cutting it very close. Distance-wise, they live 20-25 miles away, but it usually takes us about 1 hour and 15 minutes to get to their house. That’s something that outsiders have a hard time comprehending about England. Because we had to go to London, we decided to make it a family day out after the appointment, so the kids came along. Otherwise, they would have stayed with Nanny and Granddad. The walk to the train station was not too bad but they kept complaining because parts of it was uphill and they walk very slowly. We were in a rush, but taking a bus to the station would have taken more time. Somehow, we managed to make the appointment just in time. Afterwards, instead of heading towards some museums which we had talked about, the kids were distracted by Regent’s Park. What they wanted was a playground, really, not a park, but seeing “park” made them think playground, so that’s where we headed. It was a beautiful place, and HUGE. I wouldn’t have minded spending the day there. There were maps of the park everywhere because you could get lost easily. 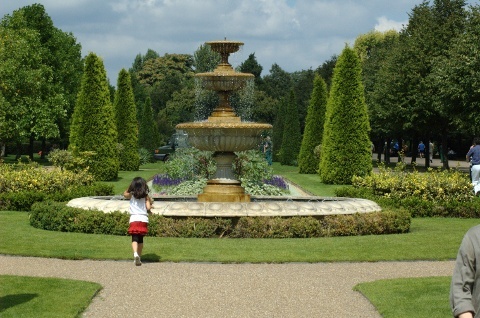 There were several gardens and avenues of trees, in addition to a boating pond and of course, the London Zoo. But, the older girl wanted the playground, so we had to head that way. We only managed to get to the boating pond before I had to stop and eat my lunch, the others having eaten theirs earlier. I sat at the bandstand area while the others sat on some deck chairs that were placed on the grass. Eventually, they joined me because the younger daughter wanted some food as well. It was just in time because the “deck chair warden” came around to collect money for the use of the chairs (GBP 2 for 4 hours). Several people left when he approached them, and only a few paid to continue sitting. We never made it to the playground because we managed to convince Miss I Want a Playground to go to the museums. We got to South Kensington and decided on the Natural History Museum. The Victoria and Albert was across the street from it and the Science Museum was a block away. I couldn’t see the Science Museum but the V&A and the Natural History Museum were both humongous. Initially, we commented on the poor use of space because we entered a huge room with a few pieces in the middle and some displays along the walls. We were in the geological area, an area of particular interest to our older daughter who likes to collect gems and rocks (the other also likes to collect rocks, the ordinary kind). Next, we entered the bird room. There was a lot more here and in a smaller space. It was so crowded that you could not feel the ventilation/air conditioning in the room. The day had started very cloudy and cool, but by afternoon it was extremely sunny and hot. Indoors, it was very stuffy. It was so bad we decided to come back another day outside of the summer holiday period, so we left after only 30 minutes in the museum. It’s a good thing that admission is free to these museums; otherwise, it would have been a wasted day. Our younger daughter wanted to go to Build-a-Bear Workshop, so we gave in, after the aborted park and museum. I don’t know why she always wants to get another Build-a-Bear because Pooh Bear is the only one she always carries with her. We took the Piccadilly line to Covent Garden. Now, I want to insert a warning to visitors about the subway exit at Covent Garden. Covent Garden subway station has no escalator; passengers are returned to street level by elevator or stairs. I was not paying attention, but my husband stated there was an announcement saying the stairs were quicker but it was alot. He asked the kids which they wanted, the stairs or the escalator. They chose the stairs and ran up. I thought, we took two escalators down the other way, so it couldn’t be that bad. Boy, was I wrong! The stairs were practically empty, and as I went up I can understand why. It was a steep spiral staircase and I was on the inside while my husband was on the outside. I was essentially going up vertically and was so breathless, I had to stop a couple of times to rest. I know I’m out of shape, but it was good to see that I wasn’t the only one. My husband was puffing and the few adventurous ones who joined us on the stairs were complaining as well. Of course, we also laughed at the whole thing because we hadn’t expected the stairs to be so steep. The kids were well out of sight and waiting for us at the top. By the time I got there, my legs were trembling. That was when my husband said we had walked an equivalent of 15 storeys. The cobbled stones of Covent Garden proved to be a nightmare on our feet after the day of walking we had had. We all felt blisters forming. Build-a-Bear was no better ventilated or less crowded, so I sat outside watching all the tourists and shoppers while my husband accompanied the girls. He had to pay for the purchases anyway. A TV crew were doing a small piece on the opera outside the National Opera House, and there were several street performers. It was quite interesting. From there, we took a couple buses home. Now, at the beginning of the day, when we arrived at the train station, we bought travel cards for the day for all of us. For one price, we were able to use all the public transport all day. It’s the most economical way to travel around London. At the end of the day, the bus driver informed us that we didn’t need travel cards for the kids unless they were over 11. We knew they could ride on the bus for free but we had been told previously that they needed tickets on the train. The driver said they were free there as well. It made us wonder why the ticket operator hadn’t asked the children’s ages. Not that we paid much for them, but any amount of savings is smart. Also, if the kids didn’t have tickets for the trains/subways, how did they get in and out of the stations? Something we’d need to investigate in the future.